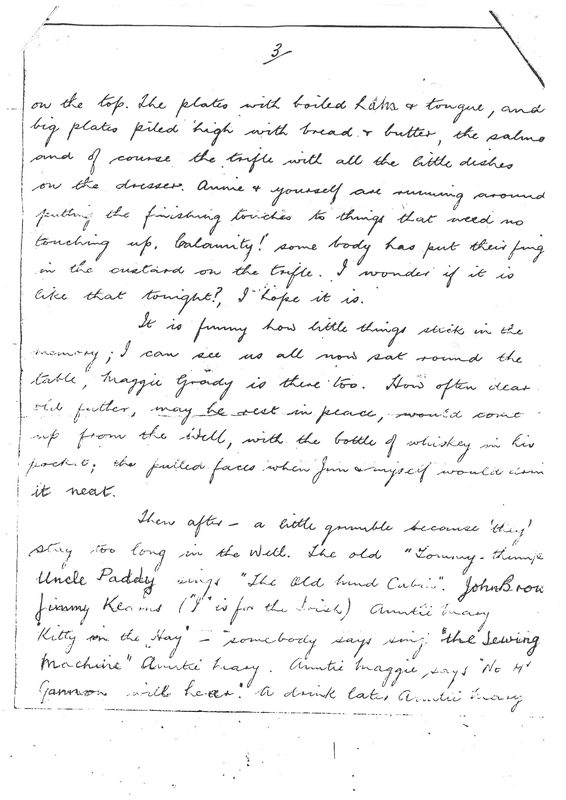 From the English side of our family, my Aunty passed on to me a copy of a wonderful letter a few years back which describes the day before Christmas of my grandmother’s brother (our great uncle), Francis “Frank” Farrell, who was in Italy on December 24 1943. Across the sea in the Pacific, my grandmother (Lola) and grandfather (Lolo) would have had their own struggles as it would have been 2 years after the Japanese invaded the Philippines on 8 December 1941, 10 hours after the attack of Pearl Harbour. 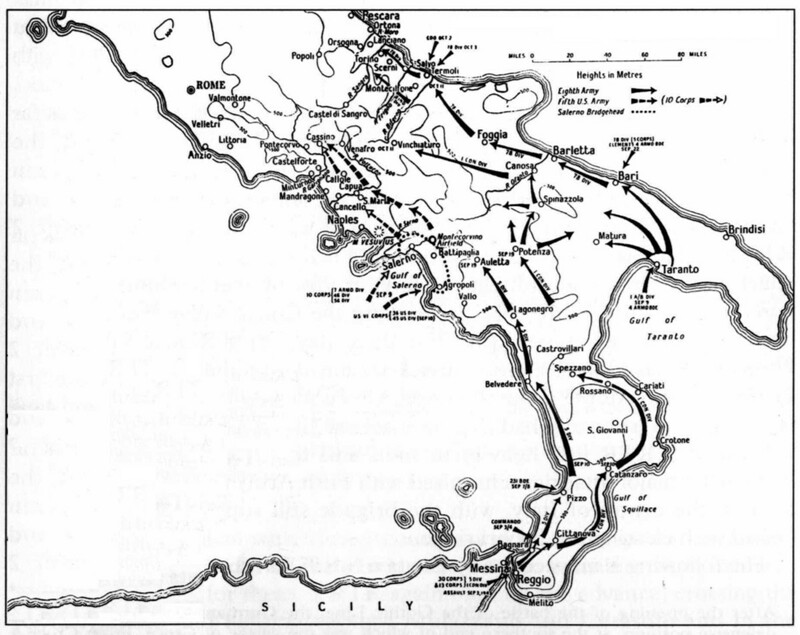 The occupation lasted from 1943–1945 and if you get the chance, read The remains of war: Apology and forgiveness by Jintaro Ishida. The author was a Japanese soldier searching for the truth of what his fellow soldiers did during the occupation; it is a brave yet heartbreaking book of what happened to Filipino civilians and the Allied forces who were captured. I wish I had the chance to speak more about that time with both sets of grandparents but sadly they have all passed away. It would have been nice to learn what shaped them and their lives, what they experienced; it is a time so different from ours today. Really do miss. Interestingly enough, Frank is not our only great uncle who fought in a war. I was told by Mom that my grandfather Felix Lay Chan’s half brother served in the Vietnam war in the U.S. army as a scout for the troops, a Specialist Four. Roberto Lay Gabana (September 13 1947 - August 22 1968) of the First Infantry Division was a casualty of hostile fire in Binh Long, South Vietnam. He was awarded the Purple Heart, received a 21 gun salute on his burial, and is honoured on Panel 47W, Row 27 of the Vietnam Veterans Memorial. He is buried in Cadiz Cemetery, Cadiz City, Negros Occ, Philippines. I remember when we visited the memorial in Washington, DC and found his name carved in the dark stone wall. When I ask Mom about him, she expresses this incredible respect and sense of awe. Apparently she reminds everyone of him, in features and personality. I am not surprised, I can imagine her fighting for what she believes in, with my Aunty screaming the battle cry. (I am smiling as I write this as I can so clearly see how true it is) I wish we respected veterans more these days, they deserve more considering their sacrifices. So many great men and women who made it their lives to keep us safe and fight so we are where we are today deserve to be honoured; we are blessed to have two (or possibly more, I haven’t completed the family history research yet) in our line. No wonder our family has so much fight in us, perhaps there is something in the saying “It’s in our blood”. 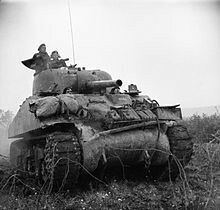 In the European front, Frank Farrell was among the officers and men from 50th Royal Tank Regiment during World War II. The Royal Tank Regiment is the oldest tank unit in the world. I’m hoping to someday get a copy of the book “50th Royal Tank Regiment, The complete history” by Stephen D Hamilton as recommended by Major (Retired) Colin Hepburn when I emailed him was trying to look into the history of Frank. It describes more about the regiment, the men and what they went through together. You can find out more about the 4th Armoured Brigade with the 50th RTR was part of by clicking here. 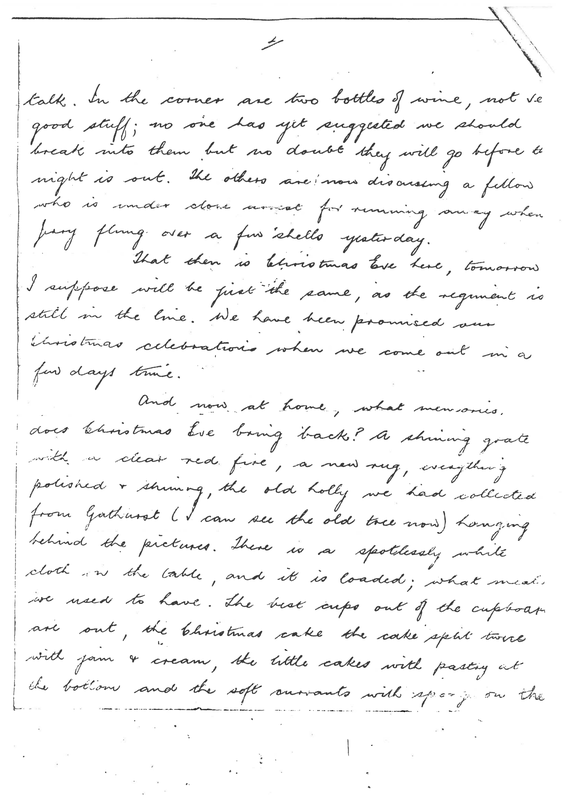 A segment from the article on-line writes that on December 25 1943, “Christmas was now at hand and for many of the brigade this was their third away from home. As the Brigade was out of the line in reserve under 5 Corps command, foraging parties went out ‘obtaining’ food and wine. On the 25th December traditional meals were served as usual by the officers and NCOs, to the Troopers of all the regiments. 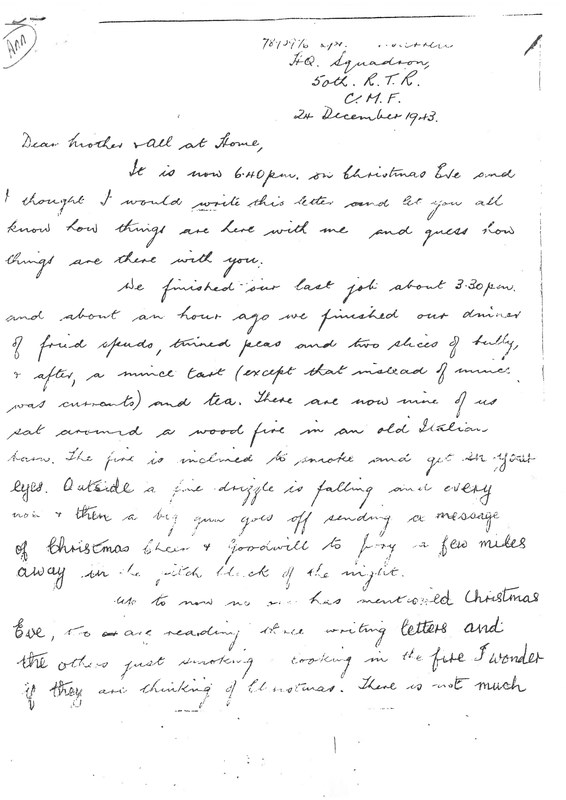 Major Oliver Woods was Santa Claus for the Sharpshooters, Corporal Lloyd Ponting trained a choir which sang carols round the various units, and the Reverend Victor Pike, the Assistant Chaplain General, held a drumhead service.” When you read the letter from Frank you can just imagine what he and the men of the regiment must have felt being able to celebrate Christmas somehow and more importantly receiving the news of going back home on soon. Knowing the history, the war did not actually end until 2 years later, so it is daunting to imagine how they must have felt through those troubling times and the scale of the loss of life. I recently saw a very well made animated data video by Neil Halloran about “The Fallen of World War II”, it is worth watching as it puts into perspective of the human cost of this and other wars. I hope there is never a World War III. I hope people come to their senses and that there will be an end to the terrorism and fighting. As you watch the news and read the headlines, you really hope that people’s lives can get back together, that we are not all sons and daughters of catastrophe doomed to repeat the past. The reality is, and I do not want to jade anyone’s view of the world but evil does exists and sometimes we have to stand up and fight. I can only hope that the good men and women, from veterans of the past, soldiers of today to the police and security guards on our streets, who make it their life to protect and fight for us, for their country, for our safety and liberty, remain safe and win. I hope that the people affected in those countries, irregardless of race or religion, can rebuild and return to their lives. I hope they are greeted with kindness and compassion and not the hateful words of racist politicians and wannabe weird haired presidents that make the general public scared of them with exaggerated tales as if they were monsters. I can imagine all these people all over the world today, some writing Christmas letters to their families and thinking of home miles away, others struggling for survival or wondering what it would be like for them on the day when so many others in the world are celebrating. The world is a scary place and I wish among all things that we had more heroes and champions rather than spectators and critics. Before I go into Frank’s letter with you, I must first look back at the last year. It has been a tough time for our family, we lost five loved ones in 2015 but we will be remembering them all with so much love and good memories. Again I can imagine them all together now in a better place away from pain, like a massive Irish gathering full of celebration, song, stories, food and drink; because all sides of our family are exactly like that no matter which continent they may be). Will always remember Aunty Sadie from Kildare, Ireland, Aunty Margaret in Birmingham (She was quite active during the war as well), Aunty Margaret in Wigan, Uncle Charlie (Who also served in World War 2 as a army driver) and Aunty Shirley in Basingstoke. As we said good bye to loved ones who moved into the space between places, we also welcomed to this world the beautiful and wonderful children of our friends and relations. What contrasts of emotions this year. This is the thing you realise, when you lose someone dear and when you see new life appear. That time is so short yet at the same time seems so incredibly immense. That life is, without a doubt and no matter at what point it is, precious and carries on. That we must live completely, not just within ourselves in our own goals and dreams, but with all those around us who make up this tapestry of our lives. A reminder to be kind and understanding, to remember it is about spending the time and not the money that means more, to really listen and understand, to embrace and hold dear no matter how far people may be. And to remember that it isn’t just those who we know who deserve our kindness and love, but to count all races and faces as a part of a big family. We all come from the same place, no matter what belief system you have, all our tales have its genesis in the same ancient fireside stories. We all feel, we all dream, and we all deserve a better world. Brought up as a Catholic I know what Christmas means to me; these days we all have different reasons to celebrate and no one is in the wrong. In 2015 we have all lost and won, sacrificed and taken (some more than others), loved and hurt. But let us move on into the new year with the knowledge of what we have learned, aim to rectify any misdeeds, not worry so much about trivial things, live simply, not necessarily aiming to work longer to achieve our goals but to work better, love honestly and respect each other. I would love to share what I managed to translate so far, it was folded away for years so there are a few parts which I cannot read (there are ??? in places I cannot read). I have also included the scans of the original letter too in case you are interested in helping me solve the puzzle. Frank’s letter takes you back 72 years ago today. Imagine yourself in that war torn barn, the bitter cold outside, a simple dinner cooked over a makeshift fire, all the men quiet and alone in their own thoughts yet sat together, the word ‘Christmas’ like a phantom that they know is there but don’t want to acknowledge because of the memories it brings and the distance they are from home, the sounds of guns and bombs in the dark night, thinking quietly about their loved ones and lost comrades, their mind taking them away from the dark into brighter happier memories. All of them wishing for peace and the end of the war in the new year. 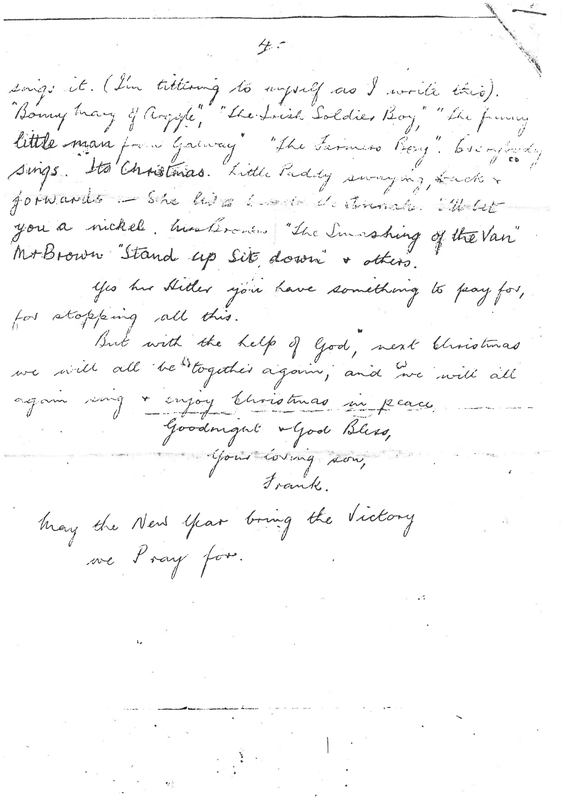 There is a lot of hope and nostalgia in this letter and I hope this reminds us of just how those in the past have given so much for our freedoms today, how others struggle to get by and the need to help when we have so much, how important we must regard family, friends and loved ones as they did – not just during Christmas but every day. How we all, on all sides, wish for peace. It is now 6.40pm on Christmas Eve and I thought I would write this letter and let you all know how things are here with me and guess how things are there with you. We finished our last job about 3.30pm and about an hour ago we finished our dinner of fried spuds, tinned peas and two slices of bully & after, a mince tart (except that instead of mince was currants) and tea. There are now nine of us sat around a wood fire in an old Italian barn. The fire is inclined to smoke and gets in your eyes. Outside a fine drizzle is falling and every now & then a big gun goes off sending a message of Christmas Cheer & Good will to all a few miles away in the pitch black of the night. Up to now no one has mentioned Christmas eve, two are reading, three are writing letters and the others just smoking and cooking in the fire. I wonder if they are thinking of Christmas. There is not much talk. In the corner are two bottles of wine, not very good stuff; no one has yet suggested we should break into them but no doubt they will go before the night is out. The others are now discussing a fellow who is under close arrest for running away when Jerry flung over a few shells yesterday. That then is Christmas Eve here, tomorrow I suppose will be just the same as the regiment is still in the line. We have been promised our Christmas celebrations when we come out in a few days time. And now at home, what memories does Christmas Eve bring back? A shining grate with a clear red fire, a new rug, everything polished & shining, the old holly we had collected from Gathwest (I can see the old tree now) hanging behind the pictures. There is a spotlessly white cloth over the table, and it is loaded; what meals we used to have. The best cups out of the cupboard are out, the Christmas cake, the cake split twice with jam & cream, the little cakes with pastry at the bottom and the soft currants with sponge on the top. The plates with boiled lamb & tongue, and big plates piled high with bread & butter, the salmon and of course the trifle with all the little dishes on the dresser. Annie & yourself are running around putting the finishing touches to the things that need no touching up. Calamity! Some body has put their finger in the custard on the trifle. I wonder if it is like that tonight? I hope it is. It is funny how little things stick in the memory; I can see us all now sat around the table, Maggie Grady is there too. How often dear old father, may he rest in peace, would come up from the Well with the bottle of whiskey in his pocket, the pulled faces when Jim and myself would down it neat. Then after — a little grumble because ‘they’ stay too long in the Well. The old ‘Tommy thimble’ Uncle Paddy sings ‘The old ???”. John Brown Jimmy Kearns (I is for the Irish) Auntie Mary “Kitty on the Hay” — somebody says sing ‘The Sewing Machine” Auntie Mary. Auntie Maggie says “No ??? Gannon will hear”. A Drink later Auntie Mary sings it. (I’m titling to myself as I write this). “Bonny Mary of Argyle”, “The Irish Soldier Boy”, “The Funny Little Man from Galway” , “ The ??? Boy”. Everybody sings. It’s Christmas. Little Paddy swaying back and forwards — “She lives ???”. ??? you a nickel. ??? “The Smashing of the Van” M & Brown “Stand up Sit down” & others. Yes ??? Hitler you have something to pay for, for stopping all this. But with the help of God, next Christmas we will all be together again, and we will all again sing and enjoy Christmas in peace. May the New Year bring the victory we pray for.